Taegerwilen, Switzerland, January 21, 2015 - The global market for laser materials processing systems reached a volume of US$ 11.6 billion in 2014. According to a preliminary analysis of 2014 data by Optech Consulting that figure is up 8% from the USD 10.7 billion reached in 2013. The demand for industrial laser systems grew double digit in China and in Asia overall. More than average demand growth was also reported for North America, while the European market grew less than average due to weak economic conditions. Globally, the market growth was driven by laser systems for high power cutting and welding as well as for precision processing, which includes low power cutting, drilling and welding, and additive manufacturing. In contrast, the demand for laser products for micro-processing in the electronics industry only showed moderate growth. Of the laser types used in materials processing again fiber lasers outpaced other laser types in terms of demand growth. The increase of the global industrial laser systems market of 8% for 2014 is in line with the long term average growth rate, which is, when averaged over economic cycles, in the 7% to 9% range. 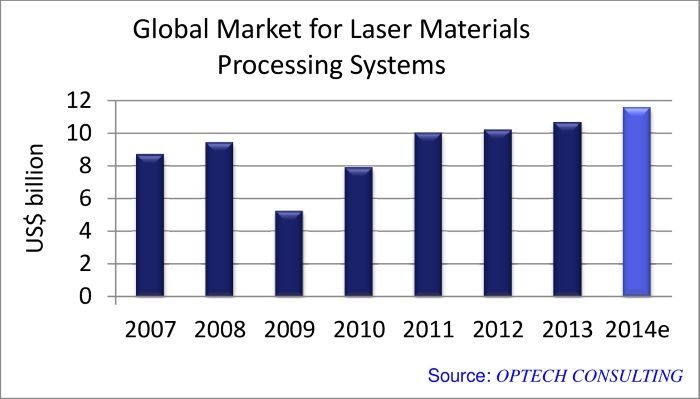 Assuming a steady economic environment Optech Consulting expects an increase of the global laser systems market in the high single-digit range again for 2015 when measured in local currencies.